Some days back i talked about the MBGN Universe 2011 Sophie Gemal heads to the Miss Universe pageant in São Paulo, Brazil, well all things in there going well and here are more info and photos of our African Queens.. The Miss Universe pageant is gearing up for the 2011 grand finale in São Paulo, Brazil on the 12th of September 2011. There are 6 beauty queens from Sub-Saharan Africa (Nigeria, Ghana, Tanzania, Angola, South Africa and Botswana), 1 beauty queen from North Africa (Egypt) and 1 beauty queen from the island of Mauritius at the pageant. So far the beauty pageant pundits and experts have rated Angola’s representative – Leila Lopes as the top African beauty queen at the pageant. 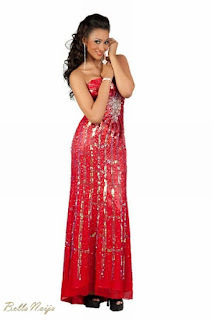 Nigeria’s Sophie Gemal seems to be blossoming at the pageant! We totally love her profile, evening wear and bikini shots!